Vuototecnica has been working in the technologies for vacuum management and use for more than 40 years. Among the latest products: MSVE vacuum generator. Vuototecnica has been working in the technologies for vacuum management and use for more than 40 years. Since the mid-eighties Vuototecnica focused his attention on foreign markets, encouraging collaboration with international companies. There are many sectors in which the company dedicates its know-how: automotive, graphics and printing, logistics, packaging, glass industry, automation, food, renewable energy, wood industry, shipyards, construction industry, and all fields where creating vacuum or gripping through suction cups can be an effective solution. The Vacuum Solutions catalogue, a real “bible”, contains over 800 pages of products and solutions. 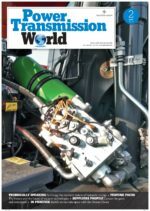 And the research goes further every day: loaders and unloaders with suction cups, degasifiers, vacuum feeders and translators, vacuum pumps and accessories for systems that work with the vacuum, for a complete range. You can choose, in the variety of vacuum components (all strictly made in Italy), the product that best suits your needs, and if you do not find anything that is right for you, Vuototecnica works for you, providing customized solutions. Sharing knowledge remains the secret of the success of the company-distributor-end customer chain. In this sense in recent years, Vuototecnica chose to focus on communication on the web with the blog, in Italian and in English, with applications for iPhone and iPad, catalogues and brochures in pdf, the website and social networks, including the highly followed youtube channel, with the most popular applications. Vuototecnica has been focusing for years on technological research and on the ad hoc design of each product according to customer needs. Optimizing and simplifying production processes in various fields of application is the diktat for the future. The headquarters, in Beverate di Brivio (Lecco, Italy), hosts educational classrooms and dialogue spaces specifically designed to promote the circulation of knowledge and a direct relationship between production and scope. Regarding the generation of vacuum, Vuototecnica offers customers a wide range of possibilities, depending on required applications, working speed and operational fields. Among the latest products: MSVE vacuum generator. Vuototecnica MSVE vacuum generators are the right solution for the use of suction cups. They are ideal for moving sheets, glass, marble, ceramics, plastics, cardboard, wood and in the industrial robotics sector, requiring excellent performances. Vuototecnica MSVE vacuum generators are the ideal solution for the use of suction cups. They are ideal for moving sheets, glass, marble, ceramics, plastics, cardboard, wood and in the industrial robotics sector, which requires appliances with excellent performance, which have at the same time reduced dimensions and weight – so as to be installed in any position. The original system of compressed air supply, via coaxial shutters, allows the supply of large quantities of air, to the ejectors and to the expulsion system, for a quicker grip and release. They are equipped with single-stage ejectors, fed at low pressure (max 4 bar), have very high emptying speeds, compared to their suction capacity. Very high speeds, for fast and performing work cycles. The check valve, integrated on the suction connection, also guarantees the maintenance of the vacuum for use, even in the absence of electricity. In complete safety and with great savings in compressed air. 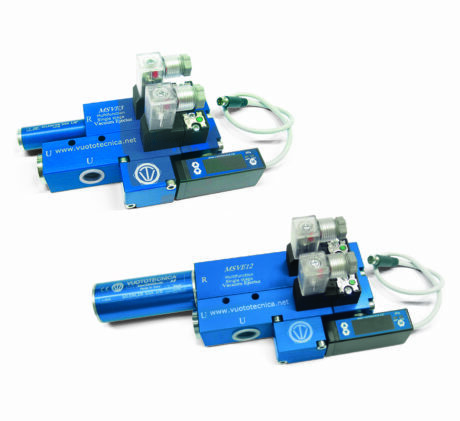 Two micro-solenoid valves manage the compressed air supply to the vacuum ejector and to the discharge counter-blow, which can be adjusted for intensity and duration by a screw flow regulator. In fact, by activating the compressed air micro-solenoid valve, the generator creates vacuum for use; when the set value is reached, the vacuum switch intervenes on the electric coil of the micro solenoid valve and interrupts the air supply. It restores it only when the vacuum value falls below the minimum value. This modulation, in addition to maintaining the degree of vacuum within the pre-established safety values ​​(hysteresis), allows a considerable saving of compressed air. A second signal of the vacuum switch, which is also adjustable and independent, can be used to allow the cycle to start when the vacuum level reached is suitable for use. Once the working cycle has been completed, the micro-solenoid valve for supplying the compressed air to the generator is deactivated and, at the same time, the expulsion micro-valve is activated to quickly restore atmospheric pressure for use. A digital vacuum switch with display and LED for switching signals, manages the compressed air supply and provides a signal to start the cycle safely. All parts are easy to inspect and maintain and they are made of quality materials. Vuototecnica is headquartered in Beverate di Brivio (Lecco, Italy). This is just a taste of what Vuototecnica offers its customers. The Vacuum Solutions catalogue, a true “bible”, contains a lot of possibilities with specifications and projects. You can evaluate the most suitable solution for you by filling out the selection help questionnaires in the catalogue, viewing the technical drawings or contacting the designers directly for support or requesting customized solutions. Visit the website www.vuototecnica.net and the blog www.vacuumdaily.net where you can find case histories, videos and many other contents. Previous Post Electro-hydraulic systems, potentialities and limits Next Post Quality and Additive Manufacturing: do the go hand in hand?